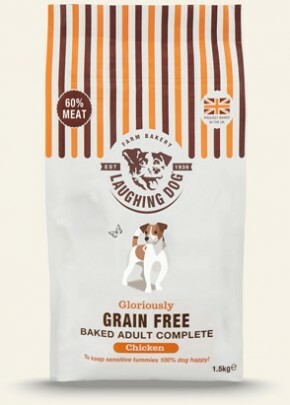 The Laughing Dog Grain Free Complete range of dog food are all tasty, hypoallergenic formulas which can help to keep your dog fit and healthy for years to come. 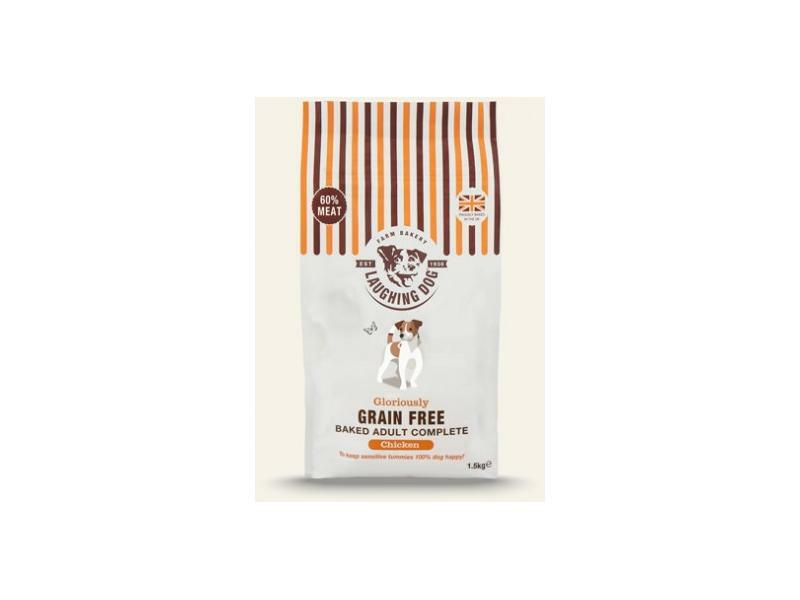 It contains a perfect balance of natural ingredients, including linseed, yucca and couch grass, which are ideal for sensitive digestions. Duck (32%), Chilled Chicken (30%), Potato Granules (12%), Potato Starch, Canola Oil, Pea Fibre, Linseed (2.5%), Cellulose Fibre, Duck Gravy, Dried Seaweed (0.8%), Minerals. *minerals include vitamins B complex, C and K, citrus extract, tocopherols, yucca extract, rosemary extract. Venison (26%), Chilled Chicken (26%), Potato Granules (12%), Dried Chicken (11%), Potato Starch, Chicken Fat, Pea Fibre, Linseed (3%), Cellulose Fibre, Minerals, Herbs (0.5% Includes nettle, couchgrass, kelp). *minerals include vitamins B complex, C and K, citrus extract, tocopherols, yucca extract, rosemary extract. Nutritional additives; Vitamin A 17000IU/kg, Vitamin D3 2000IU/kg, Vitamin E 550mg/kg, Zinc chelate of amino acids hydrate 200mg/kg, Manganese oxide 156mg/kg, Ferrous sulphate monohydrate 133mg/kg, Zinc sulphate monohydrate 97mg/kg, Copper sulphate pentahydrate 20mg/kg, Selenised yeast, inactivated 8.7mg/kg, Sodium selenite 6.5mg/kg, Calcium iodate anhydrous 3.3mg/kg. Protein 27%, Crude Fibre 4%, Fat Content 11%, Crude Ash 9%. 324 Kcal/100g. Protein 26%, Crude Fibre 3%, Fat Content 13%, Crude Ash 12%. 327 Kcal/100g. The following guide is approximate and should be adjusted to suit your dog. 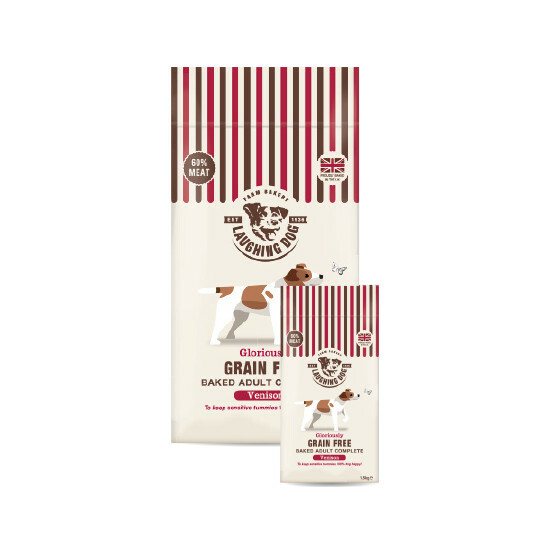 When introducing this food, do it gradually over 7 days and always ensure your dog has access to fresh water. 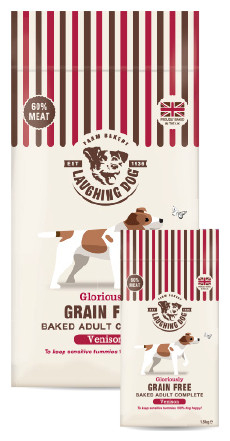 There are currently no questions for Laughing Dog Grain Free Complete Dog Food - be the first to ask one!